← One Year Later as Mr. and Mrs. 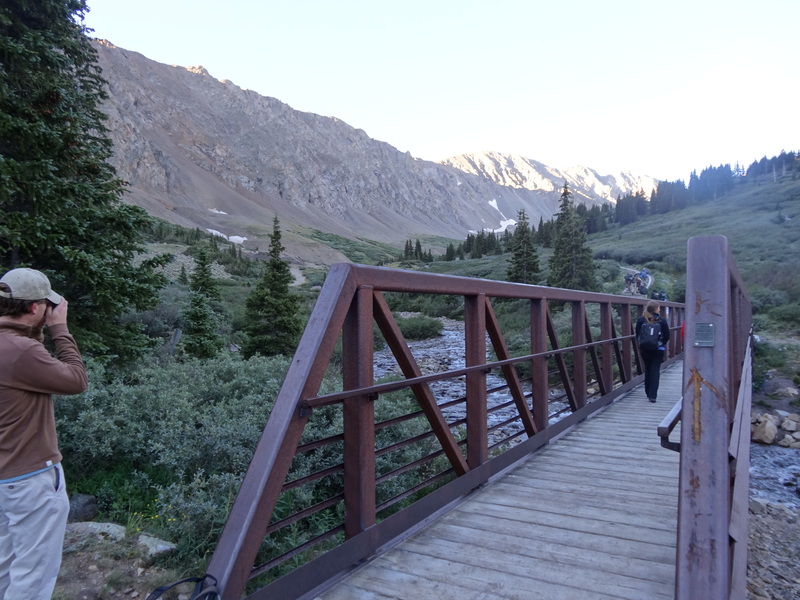 In my summer bucket list post, I mentioned 17 activities that Pie and I wanted to get done during our first summer here in Colorado. 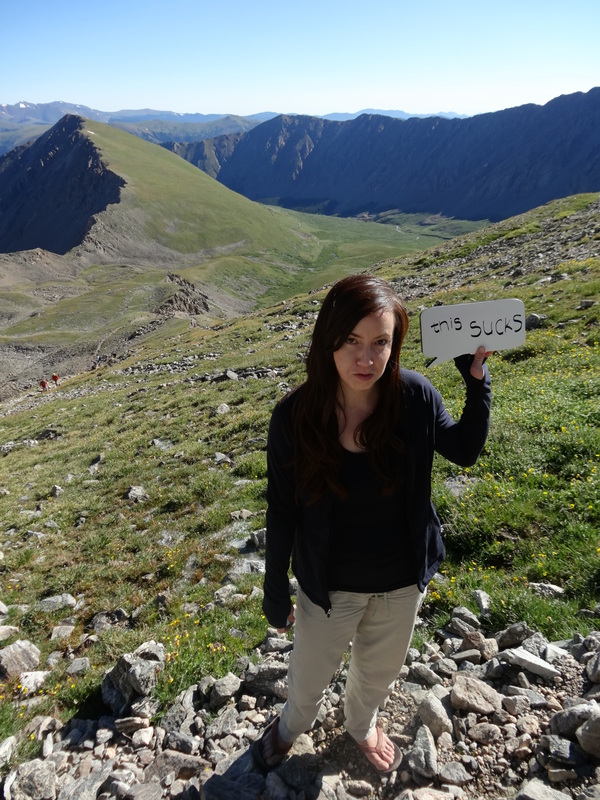 One of those items was to hike a 14er, a peak above 14,000 feet. August snuck up on us really quickly, so we have had to strategically plan out some of the last few summer weekends left in order to get everything checked off our list. 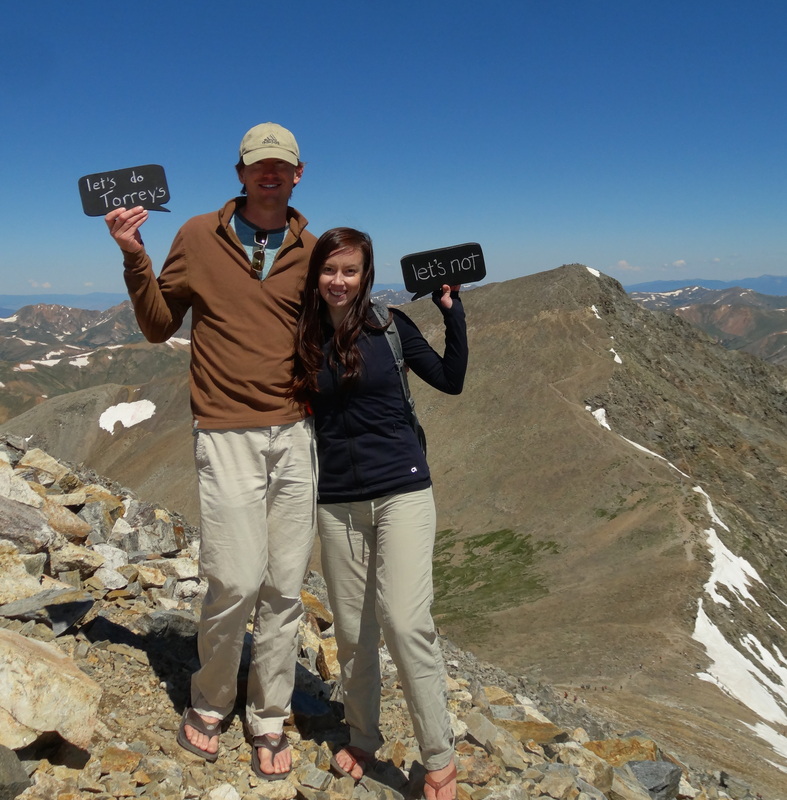 At the beginning of August, we saw a free weekend coming up and jumped on the opportunity to complete this fairly monumental bucket list item of climbing a 14er. 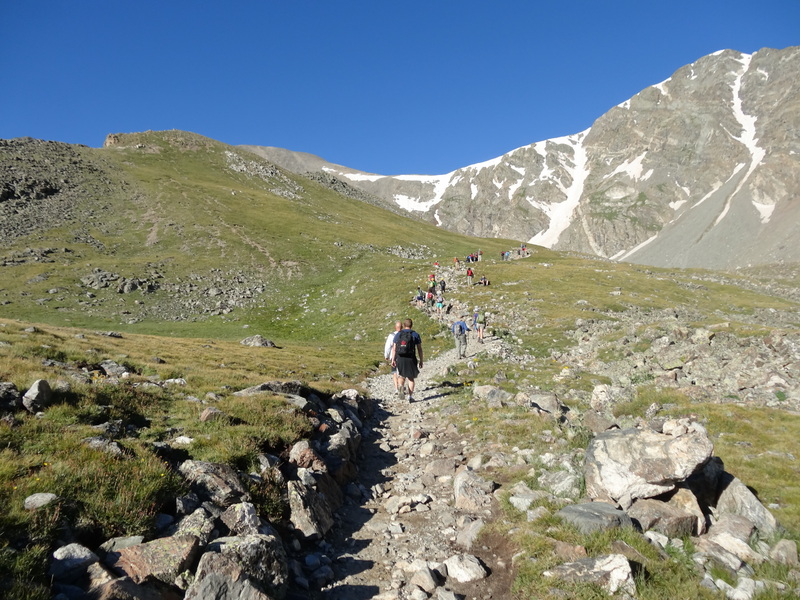 We decided to hike Grays Peak because it is touted as one of the easier 14ers to do and it’s right outside Denver. I figured this bucket list item deserved its own post because of how [surprisingly] tough it was for me to complete. If you’ll remember correctly from my last post, I didn’t make too much of a fuss over having a 14er on our bucket list. 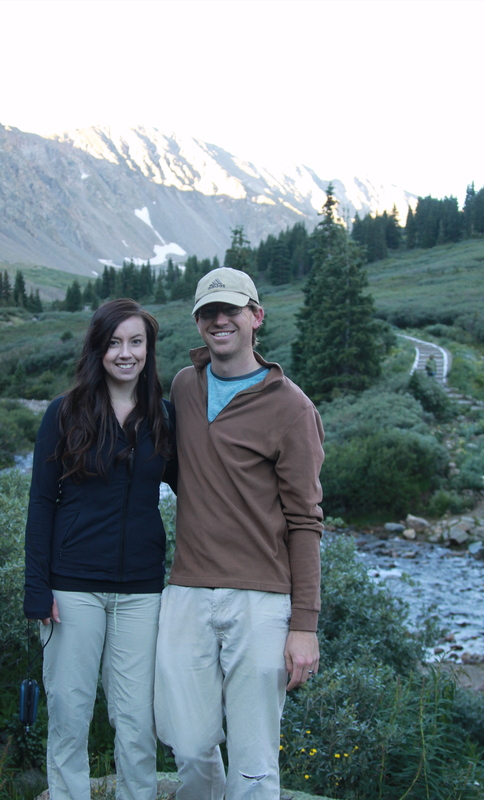 Hubby and I have done a ton of hiking and I would consider both of us to be in fairly good shape. We bike everyday; we recently completed a century bike ride in Denver; I have run a handful of half marathons; we used to do indoor rock climbing in Albuquerque 2-3 times a week; and I love taking the 12 flights of stairs at my work “just for fun.” So I thought this would be just another hike we would do with even better views than most hikes we’ve done because it was so high up. 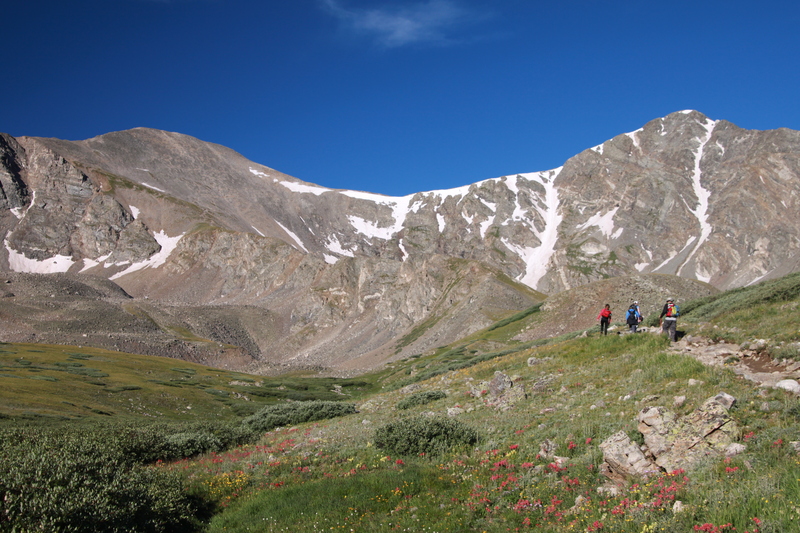 After all, I can’t count the number of times I saw the words “easy” and “fun” associated with Grays Peak. We woke up Saturday morning at 4 am, left home at 5 am, and arrived at the “winter parking lot” at 6 am. 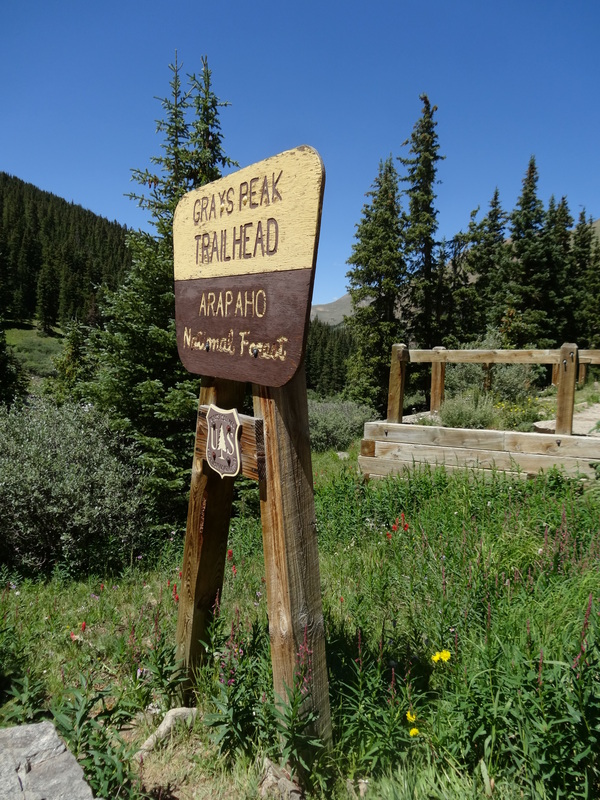 We knew that Grays Peak was one of the most popular 14er hikes in Colorado so we thought we could beat some of the crowds by waking up early and arriving to the trail early. I mean, who gets up at 4 am to do a crazy-tough hike? Well, it turns out, EVERYONE! 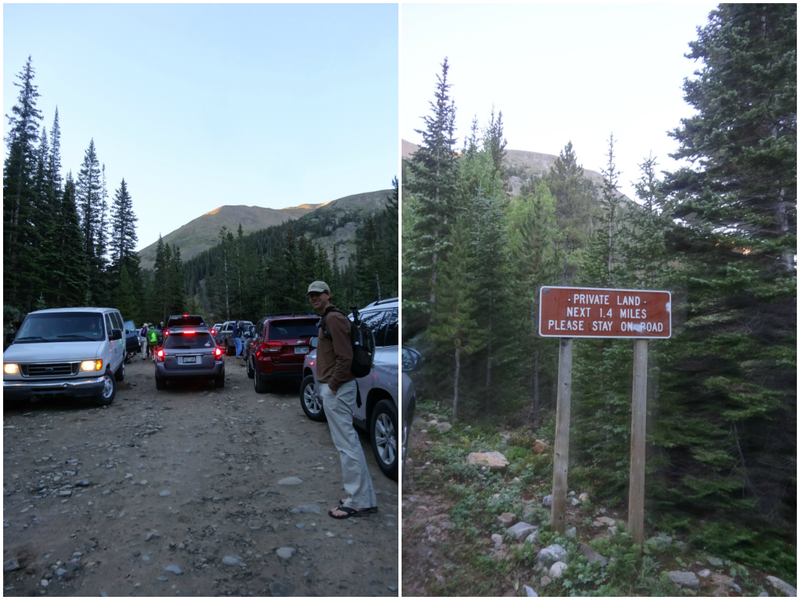 From the very start of the lower parking lot, we ran into tons of vehicle traffic headed up the bumpy, steep three mile dirt road to the “summer parking lot”, which is also where the trailhead is located. It was impossible to see past the line of ten or so cars ahead of us, so we had no way of telling exactly how many cars we were slowly following behind. We had read from the reports that about 1.5 miles up the dirt road there was a hairy spot that only 4WD vehicles could get past. We indeed were driving a 4WD vehicle that could probably get past it, but judging by how slowly the traffic was moving along the dirt road, we thought that even 4WD vehicles were not making it past the hairy spot very well and having to park before that spot. It wasn’t much longer after we pondered how far up we would be able to drive that traffic went from a crawl to a stop. We had no idea what was going on. Were people just trying to park and taking a while or was someone stuck on the hairy spot of the dirt road? After waiting about a minute or two, hubby suggested parking right where we were since it was possible we might not make it any further and we would just be wasting time sitting in the car when we could be starting our hike. The trail head was at least another 1.5 miles away, which didn’t seem like much, but when you factored in how relatively steep the hike already was before we even got to the trail head and the fact that this would add an extra 3 miles onto our already long and arduous hike, I was not totally convinced we should give up and park right there. 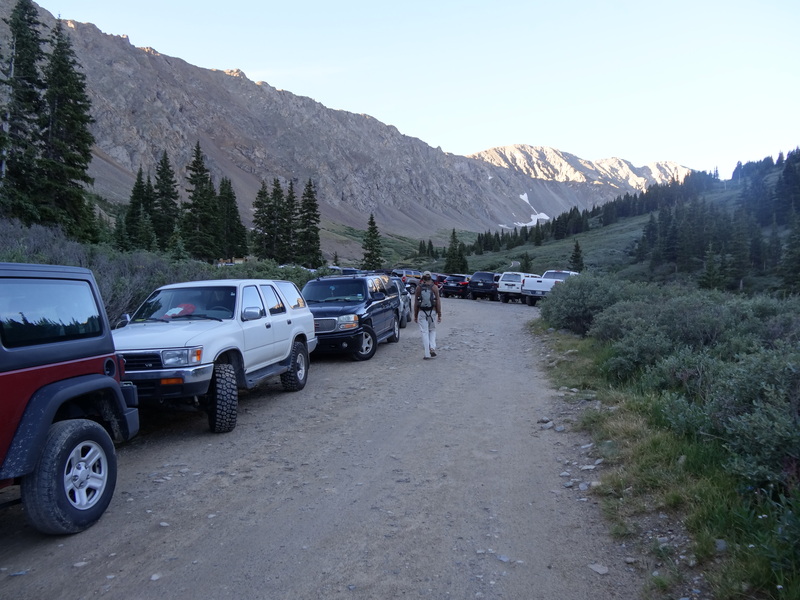 I had hoped traffic would ease up and that we would be able to make it to the trail head parking lot once the wussy vehicles parked along the road and got out of our way. The next moment we know, the decision had been made for us. Cars started moving up to park on the side of the road and we were convinced to follow suit. We decided the road where we were stopped at was too narrow and it would have been inconsiderate to park along it like everyone else had, so hubby did some crazy maneuvering and backwards driving to make it back to a better parking spot down the road. Later, we found out this was a good move! When we officially started hiking around 6:20 am, the sun had still not risen in the area where we were hiking and boy was it cold! Although I had read a few trip reports that recommended bringing gloves and a hat to start the chilly hike and I had even asked hubby that morning if he thought I should bring a jacket, somehow I just wasn’t thinking straight that early in the morning when I failed to pack any gloves. I figured I would warm up anyway once we started hiking, so it wouldn’t matter too much. Not soon after we begun our hike, we discovered what had caused the hold up earlier on the road and why everyone had to abandon their idea of driving to the upper parking lot and trailhead. There was a mess of cars at an area right before the hairy spot in the road. This is also the last opportunity people have to park before you enter private land that you aren’t supposed to be parking on. If vehicles know they aren’t going to make it past the hairy spot, this is where they start parking. Apparently everyone had arrived at this area at the same time and it created some sort of gridlock of cars. I’m still not exactly sure how the cars ended up so tangled, but there were cars parked on both sides of the road and another row of cars in between that were just locked in somehow and trying to get out. I overheard one woman saying to someone else that they had been waiting an hour for someone to move so they could all get out. It didn’t look like anyone was going anywhere any time soon so it was a good thing we had decided to follow suit and park along the road instead of attempting to drive up further. We could have easily gotten stuck in that mess with no way to back out! The tricky spot on the road. The 1.5 mile or so hike from the car to the trail head seemed like quite a hike in itself and still, I hadn’t warmed up from hiking uphill at all. I brought a small jacket which sufficed for keeping my body warm, but it was my hands that were suffering the most and definitely could have benefited from a pair of gloves. Between the cold and the mass number of people on the trail, I was already starting this hike off in a bad mood! This photo was taken just before we reached the trailhead. The upper parking lot was still in the shade when we reached it and it was already packed even though it was early. When we reached the trailhead, we snapped a few pictures and moved on quickly. I could barely feel my fingers so it was difficult to stand around and try to take a bunch of pictures like we normally would. The sun had already risen on the mountain peaks ahead of us and although I was not looking forward to climbing those peaks, all I knew was I wanted to get to where that sun was so I could thaw out! Freezing our butts off at the trailhead. The first part of the hike after the trailhead was uphill and not steep, but it was tricky because the cold weather turned the water trickling down the trail over rocks into a frozen obstacle course that was difficult to walk on. Not even a minute into our hike, someone in front of us had slipped on some rocks in a stream and then, again, someone after us. 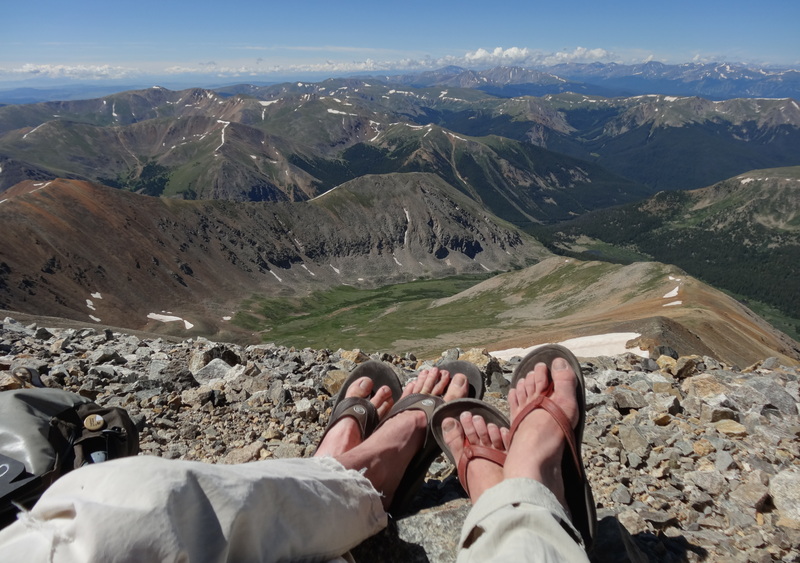 I should also mention that, like most hikes I do, I insisted on wearing my flip flop sandals and even peer pressured hubby into wearing sandals as well, insisting that the hike was just going to be strenuous and not involve a lot of tricky foot work. Surprisingly, my feet were not really that cold, but my choice in footwear still proved to be a mistake since it made it quite tricky to walk over the slippery rocks without slipping out of the sandals. I don’t know that hiking boots would have made it any easier to walk on the slippery rocks and ice — hiking poles would have been best — but the worst was still to come with the decision to hike in sandals. We had many comments along the hike about our silly and “brave” choice in footwear but I quickly brushed off all of them since I had done a gazillion steep and rocky hikes in flip flops before with no problem, including Grand Canyon and Angel’s Landing. Once we had hiked past the frozen, rocky obstacle course and my hands finally thawed when we reached the sun, I was convinced it would be smooth sailing in our sandals. Unfortunately, it was not. When we reached the more steep parts of the hike that included loose rock, I was finally starting to think that the flip flops were probably not the most ideal choice after all. Of course, I was still not willing to fully admit that my choice in footwear was a wrong one until I failed to reach the top of the mountain in them. The start of the steep, rocky part of the hike. The rest of the hike up Grays included lots of complaining, cussing, and whining from me. My choice in footwear, which caused me a lot of wasted effort trying to keep them on in the rocky parts, was really the least of my problems. The hike itself was much more strenuous than I ever expected. Although I never found myself out of breath necessarily, I did feel incredibly slow and out of shape. At times, I even felt nauseous and sick to my stomach. This was a new and frustrating feeling for me to not be able to push myself to work harder. From about 12,500 ft elevation and on, my muscles felt like slugs in molasses due to the lack of oxygen at the higher altitude. It seemed like we were taking rests at every switch back and not making any progress. I felt so defeated! Meanwhile, countless people hiked past us with seemingly no problem, most of them with smiles on their faces. At the very least, they certainly weren’t cussing at the mountain like me. I don’t know whether it was encouraging or just plain frustrating to see so many people hike past me that I had stereotyped as not being as in shape as me. It was definitely a life lesson to not judge people on what they are capable of. To my credit, however, besides being in a bad mood from the cold weather, my choice of footwear, the amount of people out, and the strenuous work, it was not a good time of month for me – as a girl, that is. 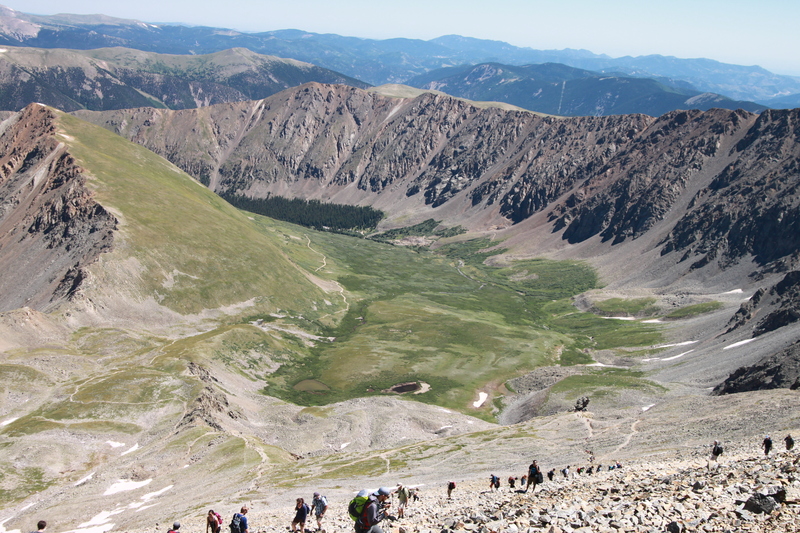 This was also another life lesson to never hike a busy 14er when it’s that time of the month. Above a certain point on the trail, there is no where for a girl to go to the bathroom since you are hiking on switch backs with absolutely no bushes and people above, below, and all around you. Believe me when I say I was NOT a happy camper about this situation. Lots of people on the trail! This super cute pika made my day! 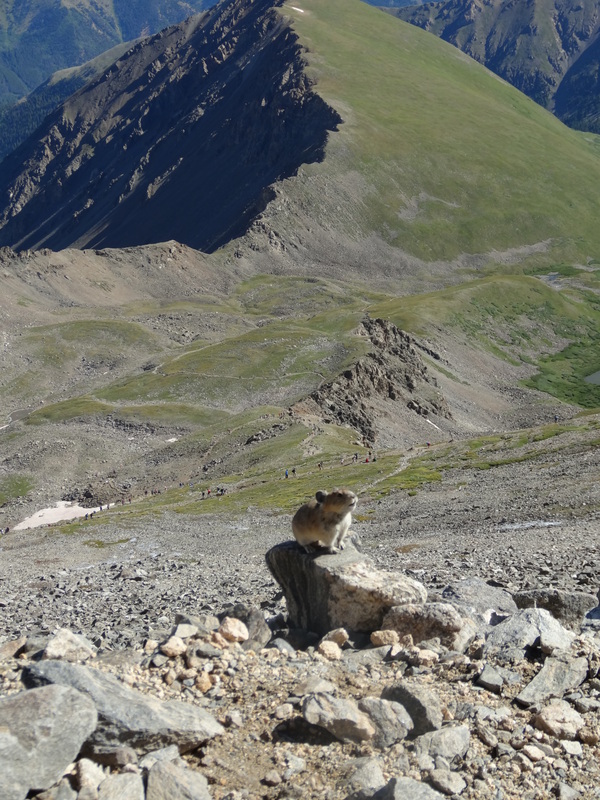 Beyond the pika, you can see the crazy amount of switchbacks we had to climb to get to that point at about 13,000 ft. Ugh. 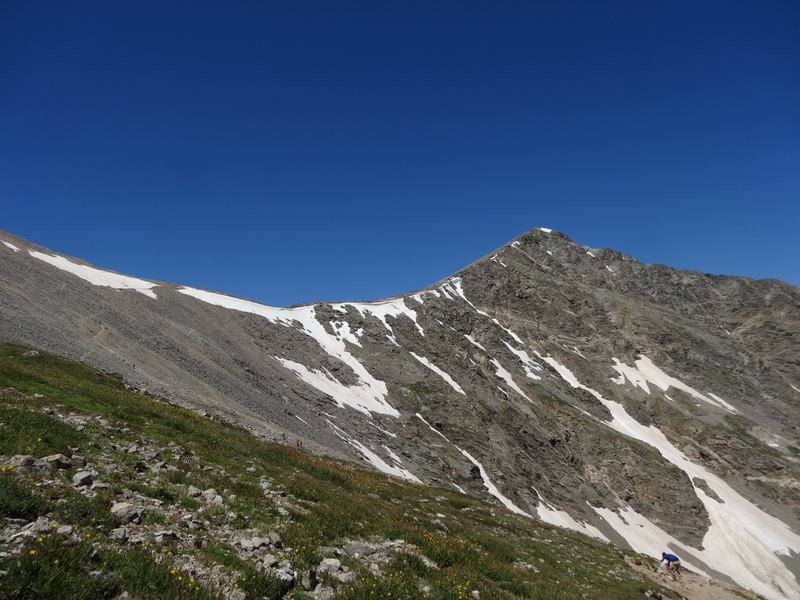 Although we had unplanned hopes of making it the other 14er peak that is right next to Grays, I had declared at about 13,000 ft that there was no way I would be able to make it up the second peak. I was having serious doubts of even making it up one peak! 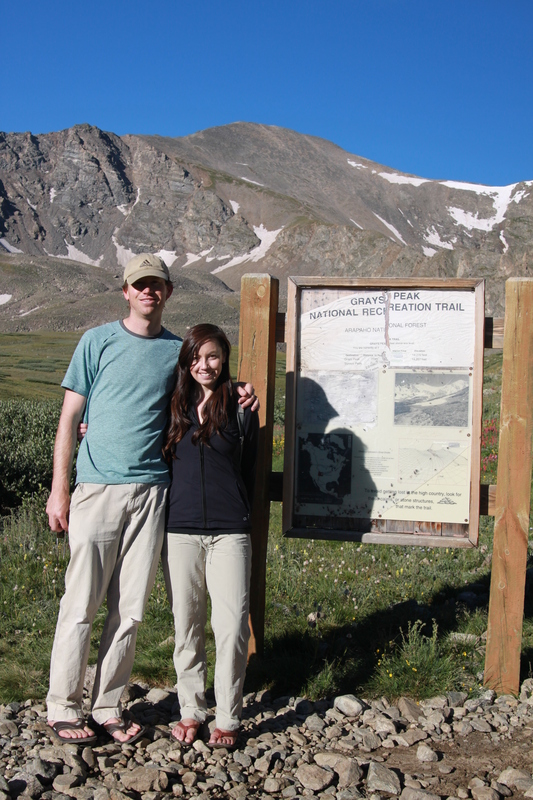 Somehow, between my cursing and complaining, we eventually made it to Grays Peak at 14,270 ft, a little after 10 am. I don’t know who was more relieved — hubby, because he didn’t have to listen to me cursing at the mountain anymore or me, because I had actually, finally made it!!! Hubby had carried my backpack for a short while towards the end of our hike to the peak and noted that it seemed heavy. I joked that I had brought my makeup bag — which he apparently probably thought was true — but actually, I had sacrificed looking pretty at the top so we could share a bottle of wine to celebrate. Totally worth the haul! Sitting at the top could not have been more blissful with our celebratory drink. Looking over at Torrey’s Peak from the top of Grays, I knew for certain that I could not make it up the other 14er peak. All the trip reports I read about the hike claimed that it was an easy hike from one peak to the other and that if you climbed one, you might as well climb the other… as if it was just that easy. Ha! But you actually have to climb down to the saddle in between the two peaks and back up again for a very steep climb to Torrey’s. Climbing Torrey’s would have been very difficult, if not impossible, in my slippery sandals. Torreys Peak in the background and the trail that you have to hike down and back up to get there! Hubby came up with this hilarious idea for our signs. After having a little wine in me I felt rested and slightly convinced that I could just tackle that other peak after all, but thankfully, hubby talked me down from that crazy idea. I’m certain his real motive was that he didn’t want to listen to me cursing at yet another mountain peak. I hated to hike down with that other 14er so close, but it ended up being a good call because the hike back from Grays alone was quite a bit and seemed like the longest hike ever. I can’t even begin to imagine the mood I would have been in at the end of the hike if we had also hiked to Torrey’s. 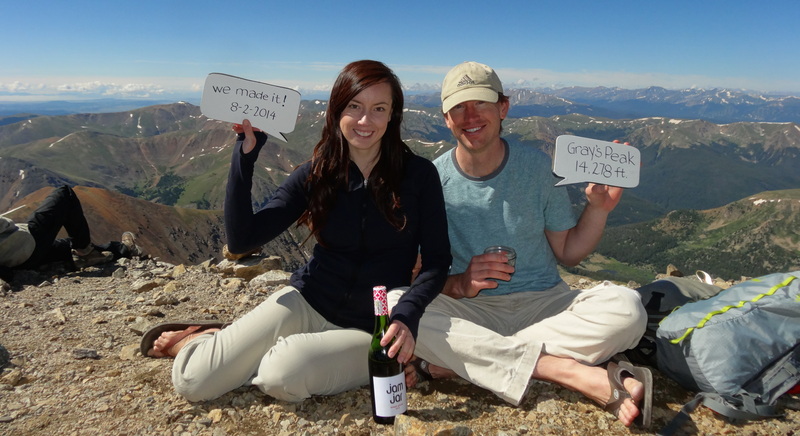 We said goodbye to Torreys Peak without climbing it. It felt so close, but so far! To make matters worse hiking down the long trail, I hadn’t been able to go pee for hours since the start of the hike around 6:30 am because of all the people on the trail and the initial walk up the mountain had created a small blister on one of my feet that was worse while walking down. I was in bad shape heading down but so eager to get to the car! The view hiking back down Grays Peak. There were still a ton of people on the trail heading up as we were heading down. Every switchback was dotted with people. The dark foresty area is were the trailhead is. When we eventually reached the trailhead, I was dreading the extra 1.5 miles we had to hike to get to the vehicle and wished we had gotten up earlier to be able to park at the trailhead. I was so done with that hike several miles ago! I cursed at every vehicle smugly making its way down the road from the trailhead. Those lucky sons of guns wouldn’t have to walk the extra 1.5 miles we did! As we reached the area where we had parked with the rest of the cars, we found out that we were actually the lucky ones. 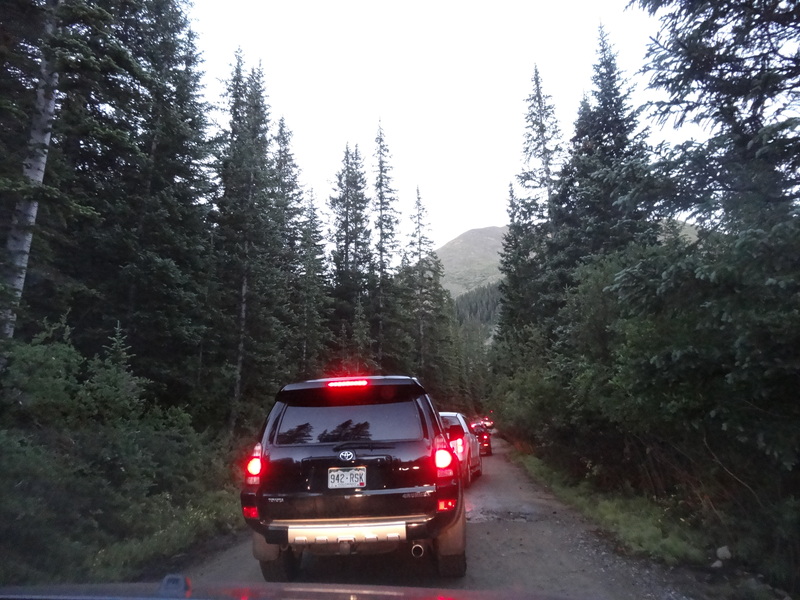 The cars that had previously passed us while we were hiking back the extra 1.5 miles to our vehicle were now stuck at the hairy spot waiting for someone to slowly back their truck down the trail. 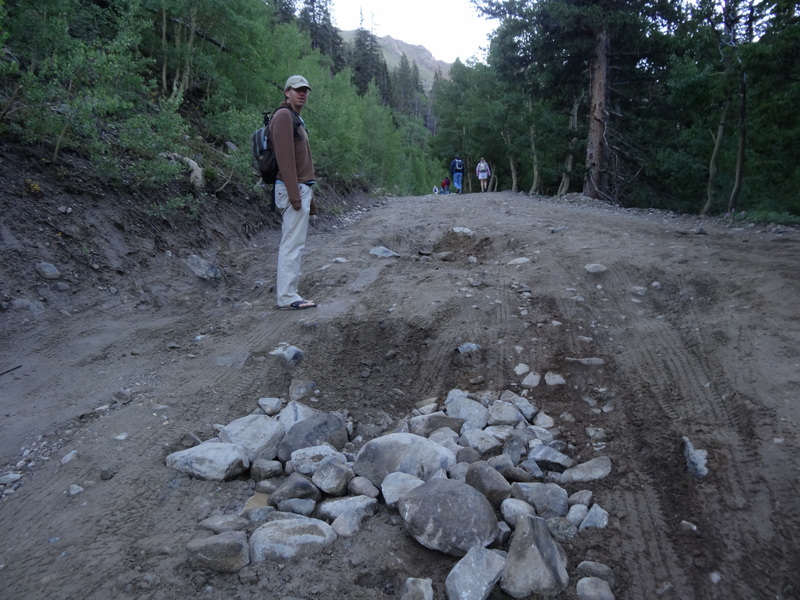 We also noticed that many more (inconsiderate) people had decided to park their vehicles along both sides of the narrow road, likely making it impossible (or at least difficult) for bigger vehicles to squeeze by once they were done with their hike. Nevertheless, we had made it to our vehicle and I could finally check off one of the least enjoyable bucket list items on our list. For the record, despite the troubles I had walking in my sandals, I still couldn’t say that I regretted hiking in sandals. I just regretted hiking in the sandals that I did. Reef sandals truly are some great sandals to hike in if you love minimal footwear like me. The Olukai ones that I decided to wear that day, which were a recent purchase, were not a good choice because of how slippery the sole is. Countless times during the hike up and down, I swore I would never do another 14er unless it was Mount Evans or Pikes Peak, the two 14ers that you can drive up. Stay tuned though, because apparently I am a glutton for punishment!